The temple, cemetery and family mansion of Confucius, the great philosopher, politician and educator of the 6th–5th centuries B.C., are located at Qufu, in Shandong Province. Built to commemorate him in 478 B.C., the temple has been destroyed and reconstructed over the centuries; today it comprises more than 100 buildings. The cemetery contains Confucius' tomb and the remains of more than 100,000 of his descendants. 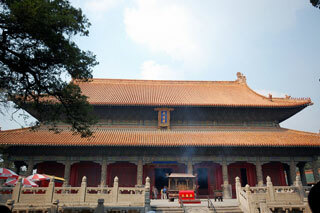 The small house of the Kong family developed into a gigantic aristocratic residence, of which 152 buildings remain. The Qufu complex of monuments has retained its outstanding artistic and historic character due to the devotion of successive Chinese emperors over more than 2,000 years. This article uses material from UNESCO World Heritage List article "Temple of Confucius in Qufu", which is released under the Creative Commons Attribution-Share-Alike 3.0 IGO License.